IS FRIDAY THE THIRTEENTH UNLUCKY? 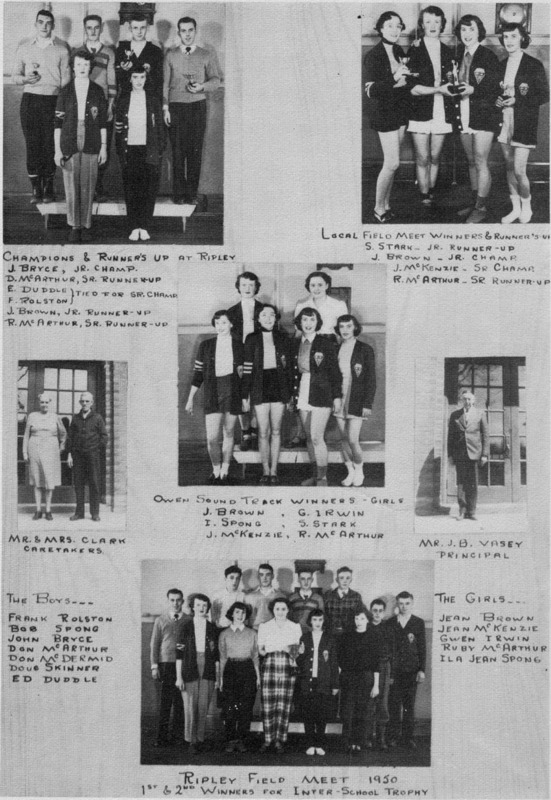 NOT FOR PAISLEY CONTINUATION SCHOOL ANYWAY; FOR ON FRIDAY OCTOBER 13, 1950 WE BROUGHT HDME FOUR CHAMPIONSHIP CUPS AND THE INTER SCHOOL TROPHY FROM THE ANNUAL INTER SCHOOL FIELD MEET, HELD THIS YEAR AT TEESWATER. RIVALRY BETWEEN THE COMPETING SCHOOLS, TEESWATER, TIVERTON, RIPLEY AND PAISLEY IS ALWAYS KEEN, BUT THE REALIZATION THAT RIPLEY WOULD BECOME THE PERMANENT KEEPER OF THE BIG SILVER TROPHY CUP SHARPENED THE CONTEST THIS YEAR. FOR FIVE YEARS THE RIPLEY ATHLETES HAD BEEN UNBEATABLE, BUT THIS TIME BY SCORING THE HIGHEST NUMBER OF POINTS RECORDED IN YEARS PAISLEY BEAT ALL RIVALS, AND CARRIED HOME THE TROPHY. MOST OF THE FIELD DAY EVENTS WERE RUN OFF UNDER COVER, IN TEESWATER'S MEMORIAL ARENA, FOR THE DAY WAS BITING COLD, AND THE OUTSIDE RUNWAYS WERE VERY SOGGY AFTER A HEAVY ALL NIGHT'S RAIN. ONLY TRACK EVENTS AND BALL THROWS WERE HELD OUTSIDE, WHERE THE WIND STIFFENED THE MUSCLES AND CHILLED THE ENTHUSIASM OF THE GAMIEST CONTENDERS. ALL OF PAISLEY WAS BURSTING WITH PRIDE WHEN THE WINNERS CAME HOME, AND FOUR SHINING CHAMPIONSHIP CUPS WERE SOON ON DISPLY IN THE DRUG STORE WINDOW.